Fashion Trends, News and Resources. 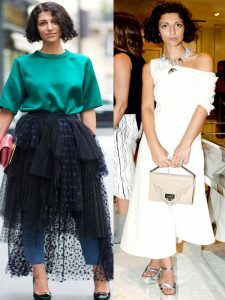 Every year fashion styles come and go and celebrities are one of those who showcase these different fashion style icons of the year. As months go by they would be seen in different movies, awards night, and various events. Couturier and stylist are hired to help them out during these events. They are expected to look their best all the time. Here’s a countdown to the 10 chicest women to hit the style scene in 2016. So therefore who among those listed will reach the icon status. ADELE EXARCHOPOULOS. A co-star of arguably one of the sexiest films of the year – Blue is the Warmest Color. This French actress strikes a balance between sultry and sweet in this opposite look in long black dress and dainty pink one. ATHENA CALDERON. A creator and interior designer who has tried many things throughout some years such as modelling, acting, singing, styling, designing and a lot more. Being a designer it does show on the outfit she’s wearing with the beautiful black revealing lace dress as oppose to the stripe pants and midriff top. BRIT MARLING. An American girl with some credentials being a writer, producer, director and actress. She personifies sophistication in her style in fashion. IGGY AZALEA. A model – slash – musician who comes from Australia and does experiments on these different versions of midriff inspired outfit. IMOGENE POOTS. This British girl with major pedigree sports in her untamed locks and streamlined looks. YASMIN SEWELL. She is from Australia who has an eye for designers on the rise. This definitely a head turner fashion statement. LILY COLLINS marked her moments at the red carpet when she hit the limelight and stride amidst clicking flash of cameras. She does look stunning in her different styles. LUPITA NYONG’O. She’s one of the actress of The Twelve Years a Slave that garnered a lot of fuzz and buzz during the Oscar awards night. In her elegant and vibrant white statement in her dress. NASIBA ADILOVA, Russian girl that keeps us guessing with her range of choices of brands. A cool newcomer yet slowly becoming a street style star with her fierce choice of style. SUKI WATERHOUSE who’s often favors for British brands. She does joins the ranks with the likes of Sienna Miller ….. yet for her she’s just starting to be noticed.